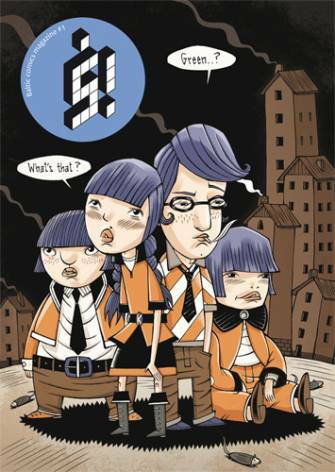 Publishing Information: SIA HungryLab, mini-comic, 48 pages, 2008. The name of this extremely attractive mini is actually S!, but the letter from the Lathuanian alphabet which includes a little mark above the more standard S. This makes it sound like a western "Shhh!" S! is a spin-off of a regular-sized magazine called Kus!, again with the little mark above the s, which makes me think it's pronounced like the old football coach's name. What this is and where it cames from gets explained on the first page of this fine, agency-supported mini-comic seemingly designed to introduce the world to the comics culture as it currently exists in the Baltic States. It may be that snippets flatter this particular group of artists, but by about page 40 I had convinced myself I needed to live where these people live, and benefit from the full publishing force of whatever it is they'll come up with next. I'm not sure anyone stands out the way, say, Andrea Bruno did in that first issue of Canicola. I like the few pages of silhouette comics done by Estonian comics scene mainstay Joonas Sildre that were on display, largely because they were the least familiar to me in terms of basic approach. A few pages from cover artists TeER were more accomplished but also something that you might have seen in a Blab! or a Buzzard some ten to fourteen years ago. That doesn't make them less lovely, or any less an obvious sign of craft chops, but you definitely read more. In fact, in about 80 percent of the cases, I wanted to see more pages, more complete stories. Like any growing scenes, this one seems to offer a series of promising approaches and a conception of how they might all fit together that just for the individual comics involved is going to be a unique one. I want to see more, and in every case but a pair of cartoonists, I want to see a lot more.